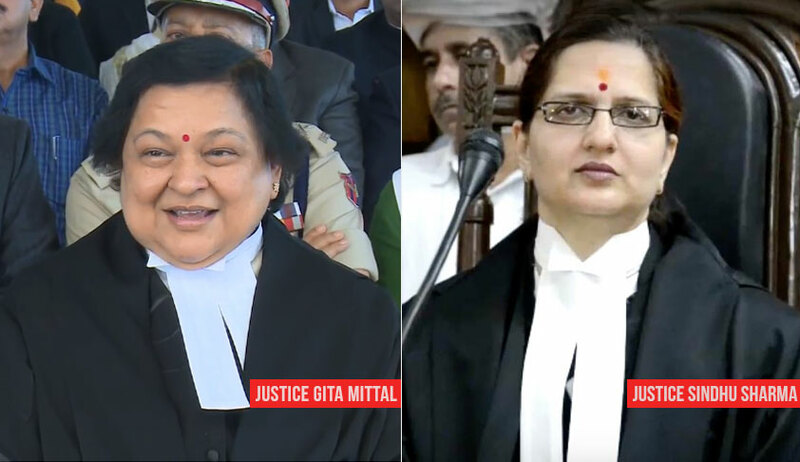 Justice Sindhu Sharma was sworn in as a judge of the Jammu and Kashmir High Court on Friday, followed by Justice Gita Mittal’s swearing-in ceremony as the Chief Justice of the High Court on Saturday. The event is particularly notable because, with the two appointments, the Jammu and Kashmir High Court finally has woman judges now, for the first time in its 90 years long history. The High Court was established in 1928 by the then Maharaja of Jammu and Kashmir, Hari Singh, prior to which the Maharaja used to be the final authority in the administration of justice. Since then, the High Court has had 107 judges and Chief Justices, but none of them has been a woman. This is despite the fact that the High Court has had several illustrious woman lawyers practicing before it, including Shaista Hakeem, Surinder Kaur, Neeru Goswami, Seema Shekhar, and Zainab Shams Watali. However, none of them was invited to the High Court Bench. The legal profession, in general, has often been notorious for being an All Boys Club, with the first woman to formally enter the legal practice being Cornelia Sorabjee, the first female barrister in India. However, she was recognized as a barrister only in 1923, despite having cleared the pleaders exam of the Allahabad High Court in 1899, after the law barring women from practising was altered. It is no surprise then that the country got its first female Additional Solicitor General with Ms. Indira Jaising’s appointment only in 2009. Much similar to the Bar, the Bench is also indicative of the gender disparity that exists in the institution. While a recent study had shown that the lower judiciary across India has a mere 27.6 per cent female judges, the state of affairs at the higher judiciary isn’t less dismal, considering that the Apex Court had to wait for almost four decades to get its first woman judge, Justice Fathima Beevi, who was elevated to the Apex Court in 1989. In fact, it was only this month that the Supreme Court has, for the first time ever, had three woman judges—Justices R. Banumathi, Indu Malhotra, Indira Banerjee— simultaneously presiding in its courtrooms. The issue is certainly not restricted to India, with developed countries such as the UK and Ireland, and some international bodies also grappling with the same trend. For instance, the UK Supreme Court got Brenda Hale as its first female President only last year. Further, while there have been qualms about reducing these judges to their genders, the concerns on representative justice and the necessity of more female voices to ably reform a patriarchal society essentially outweigh these qualms. Nevertheless, the recent developments at the Supreme Court as well as the Jammu and Kashmir High Court are quite welcome, with the hope that appointment of a woman judge would be a matter of course some day.